Render of King Bulblin from The Legend of Zelda: Twilight Princess. 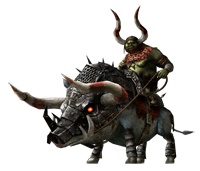 King Bulblin (キングブルブリン, King Bulbin) is a mini-boss from The Legend of Zelda: Twilight Princess. He appears along his steed, Lord Bullbo. Link fighting King Bulblin on horseback on the Bridge of Eldin. 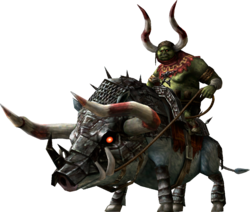 In The Legend of Zelda: Twilight Princess King Bulblin is the leader of the Bulblins, a race of small goblin-like beings. He acts as the driving force of Link's actions in the beginning of the game, before Zant's introduction: he attacks the Ordon Village and kidnaps Ilia and Colin, incapacitating Link. Link then travels the land of Hyrule to find the kids of Ordon, meeting up with and defeating King Bulblin four times over the course of his adventure. One of these battles is set on the Bridge of Eldin: in it, Link fights against King Bulblin jousting-style, riding Epona while his foe rides Lord Bullbo, his oversized Bullbo steed. After his defeat, King Bulblin falls in the river below. Contrary to his Smash appearance, however, he is not the cause the bridge's destruction: rather, part of the bridge is transported to the Gerudo Mesa by a Twilight Portal. King Bulblin occasionally uses a war horn to alert his Bulblin troops. King Bulblin on Bridge of Eldin charging at Kirby and Zero Suit Samus. King Bulblin appears as a hazard on Bridge of Eldin. Occasionally, a war horn trumpets: shortly after, King Bulblin appears from either side of the stage and rides Lord Bullbo across the bridge. When in the middle of the bridge he drops a bomb which explodes after a short while, blowing up a huge portion of the stage. He can also damage characters by running into them. Sometimes, King Bulblin is followed by a Bulblin minion on foot, which can be attacked and knocked away by players, but does not attack or cause damage itself. Hitting King Bulblin can temporarily stun him. In this state he does not hurt characters, but he still drops the bomb. King Bulblin's trophy appears only in Brawl. King Bulblin is the boss of the creatures who kidnapped Ilia, Colin, and the rest of Ordon Village's children. Characterized by his appearance atop a boarlike beast named Lord Bullbo, he encounters Link time and time again. When he loses in his final battle, he pays subtle respect to Link when he says, "I follow the strongest side!" King Bulblin on the Bridge of Eldin in Smash 4. 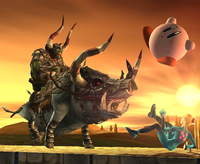 King Bulblin reappears as a stage hazard on the Bridge of Eldin in Wii U version of Smash 4. King Bulblin on the Bridge of Eldin in Ultimate. King Bulblin reappears yet again as a stage hazard on the Bridge of Eldin in Ultimate. He is also seen in the background for one of Spirit Modes along with Lord Bullbo. This page was last edited on February 18, 2019, at 00:18.